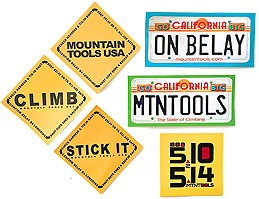 MOUNTAIN TOOLS - Great Climbng Gear, Great Prices! Home of the Webolette, Packs for Climbers and expert advise. 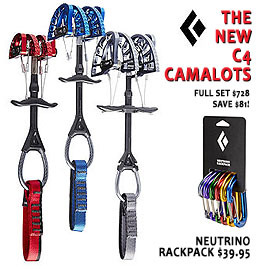 New, redesigned Camalot C4 are now 10% lighter just as durable, with a wider trigger for easier handling. Double-axle design offers the widest range for each size. 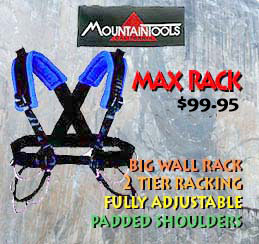 Order up a set and lighten your rack by a pound and a quarter. Pick up Neutrino Rackpacks for easy color coded racking. Full set/10: $728, save $81.00! Core set/7: $454, save $50.00! 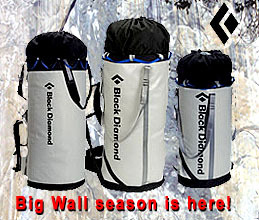 haul bags for your tall walls and difficult routes that may mean longer vertical vacations and of course more fun!. Get equipped with the ZION to hold, protect and haul your valuable cargo of water, food and survival gear as well as transport it comfortably to your chosen route. Stacked EVA layer plus air channeled midsole reduces impact on ankles and knees plus staves off cold from below. Completely waterproof Sympatex is also highly breatheable - for dryness that you can feel. Drier feet = warmer feet and greater comfort. Volume is med-wide with rounded toe box, suited for 6000 M peaks, ice climbing and winter mountaineering. GET SOME FREE STICKERS WITH YOUR ORDER! 1ST ORDER INCENTIVE - TAKE 15% OFF INDIVIDUAL ITEMS TILL 04/30 - must mention at the time of order. By special agreement and support from DMM, MtnTools is equipped to replace your dated slings on Dragons, Demons & Torque Nuts with factory original material. If you purchased these cams early on - now is the time to resling! tECH tIP Here's how to rig a Tomahawk for placement in horizontal seams and pin scars. Racks better too. 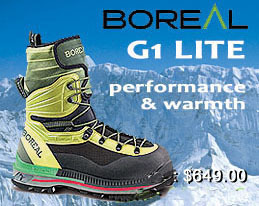 SAVE BIG on rock shoes, approach shoes and mountain boots in select models & sizes. Deep discounts for style, color and model changes. Fit guarnanteed, performance assured. Hurry for best selection. Call for advice. Lightweight, easy to grab and clip and very easy on the wallet! Limited to stock on hand. to APO & FPO and to your home or business via Priority Post and Federal Express - both traceable, insured and quick - usually 4-10 days ARO. If you, a friend or an associate is travelling to the US - we can delivery to your hotel, business, post office (Yosemite or anywhere). Click the Map for currency converter. Access to our public lands and historic climbing areas are threatened! Don't let Congress gut the Antiquites Act and reduce National Monuments in SW Utah by 80%. Lend your voice and send a donation to the Access Fund in support of a multi -plantiff law suit filed by industry leaders and conservation groups. The products we sell may contain one or more chemicals known to the State of California to cause cancer, birth defects or other reproductive harm. Take advantage of increased efficiency and better positioning for both leading and following. 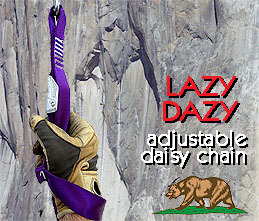 LAZY DAZYs are super easy to adjust, provide a "wRest" loop and crafted from continuous Climb Spec web with 3500 lbf end strength - to eliminate any separation anxiety. 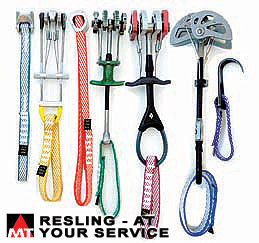 Great cleaning & positioning sling for sport routes too! $24.95 ea / use in pairs. See CLIMBING #334 for a very nice review. Made in California - GRIZZLY GUARANTEE! 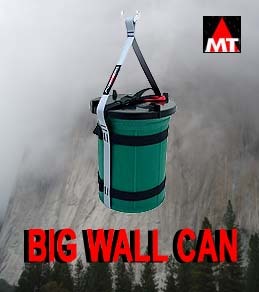 TRADITIONAL BIG WALL USE - Because Nature doesn't always schedule her calls... and you might not be hangin' out at the bivy or near a ledge, so you'll appreciate this simple solution. The BWC is washable and reusable as defined by the Bureau of Land Management, National Park Service and National Forest Service. $79 Made in USA. 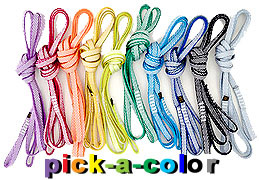 One for each end of your rope. Lighter & more compact than cord! Mention a competing online offer by an authorized U.S. Dealer for in stock merchandise when you place your order so we can assure the lowest Sale Price. Provide the url for our confirmation in the Comments Box. Guaranteed!